Please turn up your speakers for an optimal experience. See how our intuitive technology can help you take charge of your trading ideas. What do you mostly trade? Approximately how many trades do you place monthly? What is your level of trading experience? What type of trading platform do you use most frequently? Do you consider yourself more of a technical or a fundamental trader? How many resources do you use to research or find trade ideas? Would you like to see how our mobile trading app works? Yes No, let's keep going. Would you like to learn about how our trading specialists can help you? Now that you've seen the highlights, get a customized walkthrough that matches your trading style. Enroll and make a qualifying net deposit of $100,000 in a Schwab account to earn your trades. Options carry a high level of risk and are not suitable for all investors. Certain requirements must be met to trade options. Please read the Options Disclosure Document titled Characteristics and Risks of Standardized Options before considering option transaction. With long options, investors may lose 100% of funds invested. Multiple leg options strategies will involve multiple commissions. Spread trading must be done in a margin account. Covered calls provide downside protection only to the extent of the premium received and limit upside potential to the strike price plus premium received. Writing uncovered options involves potentially unlimited risk. 1Restrictions apply: The $4.95 commission does not apply to foreign stock transactions, large block transactions requiring special handling, or restricted stock transactions. Foreign ordinary shares that trade online in the U.S. over-the-counter (OTC) market and do not settle in the U.S. will have a $50 foreign transaction fee added to the cost of the transaction. All broker-assisted and automated phone trades are subject to service charges. See the Charles Schwab Pricing Guide for Individual Investors for full fee and commission schedules. Employee equity compensation transactions are subject to separate commission schedules. Multiple leg options strategies will involve multiple commissions. 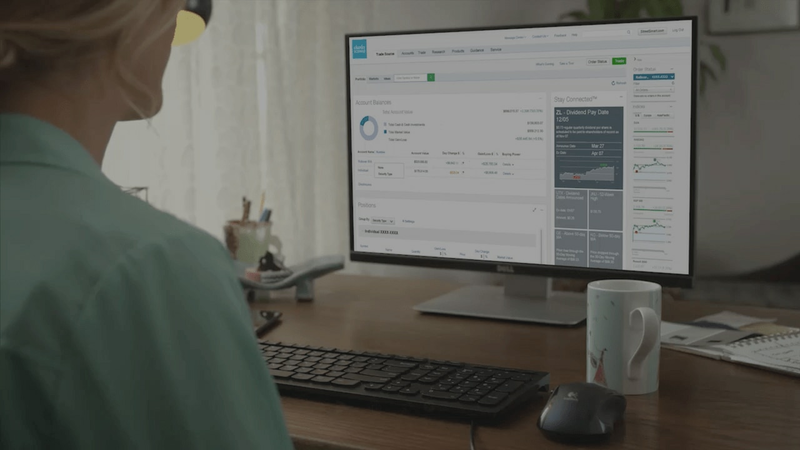 Schwab Trading Services™ includes access to StreetSmart® trading platforms, the Schwab Trading Community, and Schwab trading specialists (a Schwab brokerage account is required). There are no fees to use Schwab Trading Services. Other account fees, optional data fees, fund expenses, and brokerage commissions may apply. Schwab reserves the right to restrict or modify access at any time. Schwab brokerage account online applications that have the "Schwab Trading Services" box checked will automatically be enrolled. For questions, call 888-245-6864 to speak to a Schwab Trading Services representative. All-In-One Trade Ticket is a registered trademark of optionsXpress Holdings, Inc. used with authorization. Idea Hub offers self-directed investors the ability to explore new trading ideas for options that are determined based on pre-set screening criteria. Please note that Idea Hub does not consider open orders, existing positions, or other factors, and is solely intended for educational and informational purposes. The examples within the Idea Hub are not intended as recommendations to buy, sell or hold any particular security nor implement any particular strategy. Users of the Idea Hub should not make investment decisions based solely upon the ideas generated by this tool. You are solely responsible for your investment decisions, and should carefully evaluate the examples to help determine whether or not they are right for you based on your own personal situation. The use of this tool does not constitute an investment recommendation by Schwab, and should also not be considered financial, legal or tax advice. Where specific advice is necessary or appropriate, Schwab recommends consultation with a qualified tax advisor, CPA, financial planner, or investment manager. The projections or other information generated by Idea Hub regarding the likelihood of various investment outcomes at expiration are hypothetical in nature, do not reflect actual investment results and are not guarantees of future results. The above calculations do not take into consideration all costs, such as commissions, taxes and margin interest which may impact the results shown and users of Idea Hub should not make investment decisions based solely upon values generated by it. Please contact a tax advisor for the tax implications involved in these strategies. The Trade & Probability Calculator provides calculations that are hypothetical in nature and do not reflect actual investment results, or guarantee future results. The calculations do not consider commissions or other costs, and do not consider other positions in your account(s) for which this specific trade is taking place. Rather, these values are based solely on the individual contract or pair of contracts in this specific trade. In addition, the calculations do not consider the specific date of dividend, early assignment, and other risks associated with option trading. Options which expire before the estimated dates have calculated values based on underlying prices as of the estimated dates, as if option is expiring on the estimated date. Investment decisions should not be made based solely upon values generated by the Trade & Probability Calculator. In addition, the calculations incorporate annualized dividend yields and do not consider ex-dividend dates, early assignment, and other risks associated with option trading. If an option expires before the estimated date, it is treated as though it expires on the estimated date. Investment decisions should not be made based solely upon values generated by the Trade Calculator. Securities and market data are shown throughout this presentation for illustrative purposes only, and do not constitute a recommendation, offer to sell, or solicitation of offers to buy any securities. Requires a wireless signal or mobile connection. System availability and response times are subject to market conditions and your mobile connection limitations. Functionality may vary by operating system and/or device. There is no guarantee that execution of a stop order will be at or near the stop price. Recognia, Inc. is not affiliated with Charles Schwab. Schwab does not endorse any of the content or features made available to you in Recognia’s “Technical Insight” and “Strategy Builder” tools. Market Edge and Second Opinion are registered trademark(s) of Computrade Systems, Inc., which is not affiliated with Charles Schwab & Co., Inc.
S&P Capital IQ is a registered trademark of Standard & Poor’s Financial services LLC, which is not affiliated with Schwab. Access to electronic services may be limited or unavailable during periods of peak demand, market volatility, systems upgrade or maintenance, or for other reasons.